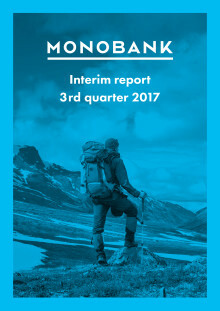 Monobank ASA ("Monobank") continued to grow in the third quarter, with strong net lending growth and increased net profit to NOK 5.7 million after tax. The entry into Finland, commencing operations late May, has been a success, and reached a solid volume despite a conservative approach to acceptance of credit. Geographical expansion is a vital part of Monobanks strategy and the experiences from the Finnish operation will be utilised when planning further expansion. To fund further growth for geographical expansion, continued growth in Norway and increased product offering such as credit card, Monobank plans an equity issue of NOK 175 to 225 million at NOK 3.70 per offer share directed towards certain existing shareholders and external investors. 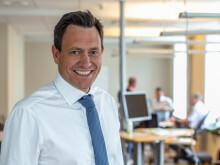 Prioritet Group AB and Songa Trading Inc. have committed to subscribe for around NOK 40 million. JO Capital AS has committed to subscribe for up to NOK 25 million and has also guaranteed for an additional NOK 92 million. Allocation to JO Capital AS of any guaranteed amount will be conditional on JO Capital AS receiving acceptance from the Financial Supervisory Authority of Norway (the "NFSA") on its application to acquire a qualifying holding in Monobank. Total pre-commitments amounts to NOK 80 million. Depending on the outcome of the private placement and JO Capital AS' application to the NSFA, the board of directors will propose to the extraordinary general meeting that a subsequent private placement is directed towards JO Capital AS at the same price as in the private placement, limited to the minimum of the number of shares that JO Capital was allocated under the guarantee and any lower ownership limit set out by the NFSA. 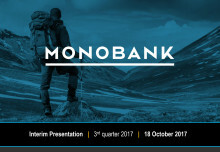 Mononbank intends, subject to and following completion of the private placement, to conduct a repair issue at the same subscription price as in the private placement, not exceeding an amount in NOK corresponding to EUR 4,999,999. In the repair issue, shareholders in Monobank as of the end of trading on 17 October 2017, as registered in the VPS as of the end of 19 October 2017, who did not participate in the private placement or presound and who are not resident in a jurisdiction where such offering would be unlawful or, for jurisdictions other than Norway, would require any prospectus, filing, registration or similar action, will be granted non-transferable subscription rights. 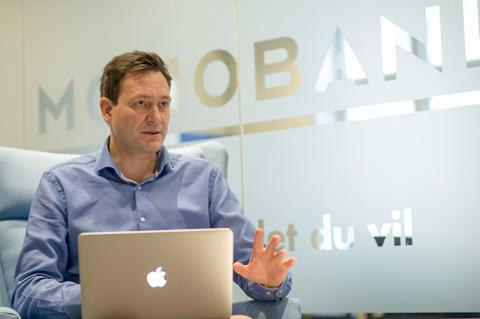 Hence, the existing shares in Monobank will trade exclusive of the right to receive non-tradable subscription rights in the repair issue from and including 18 October 2017. Completion of the private placement and the repair issue will inter alia be dependent upon the board of directors resolving to allocate shares in the private placement, approval by an extraordinary general meeting and approval by the NFSA. The credit quality has improved in line with expectations. With a rapidly growing data base, the tuning of the internally developed credit model continues. The goal is to further optimize credit quality overall and selective pricing among different customer groups. The bank is starting to see the effects of this work. Total loans amounted to NOK 1 904 million excluding prepaid agency commissions and unspecified loss provisions. Of total loans outstanding at 30 September, NOK 186 million was extended to Finnish customers. Overall, Monobank target aggregate net loans outstanding to NOK 2.3 billion at the end of 2017. Net interest income in the quarter was NOK 44.6 million and the net interest margin was 8.0 per cent. Operating costs were in line with expectations. Operating profit before impairment provisions was NOK 18.5 million compared to a profit of NOK 12.3 million in the previous quarter. While Monobank will continue to focus on unsecured consumer financing in Norway and Finland, the bank remains committed to develop its core business into other geographical areas. Cross border launches are expected to achieve considerable operational synergies and further strengthen the bank's growth platform. It will also contribute to diversify the business model and regulatory risk exposure. Consistent with the bank's growth strategy, the capital structure and capital adequacy will be monitored to ensure that liquidity and capital position are maintained at satisfactory levels. "Through the third quarter the entry into Finland have confirmed that we have a solid and scalable growth platform in place. The Finland expansion has been received well a and we are pleased to see that overall credit quality is developing according to plan. We are executing on our expansion strategy, with solid growth in Norway, geographical expansion as well as preparing for introduction of new verticals such as credit card. As a consequence, the board with backing from our key investors, has decided to carry out an equity issue to fund further growth. In total we are well positioned, and I'm confident that we will deliver on our targets in 2017, and reach new goals and arenas in 2018", says Bent H. Gjendem, Chief Executive Officer at Monobank.